The WebiTaur, bass synth on the site AngryOctopus is now compatible to WebMidiLink. This is a still very primitive but interesting attempt. 'WebMidiLink' is a proposal for the sync and transport midi messages inter web-based applications. Web-based synthesizers become possible with HTML5 but still they should be stand-alone. 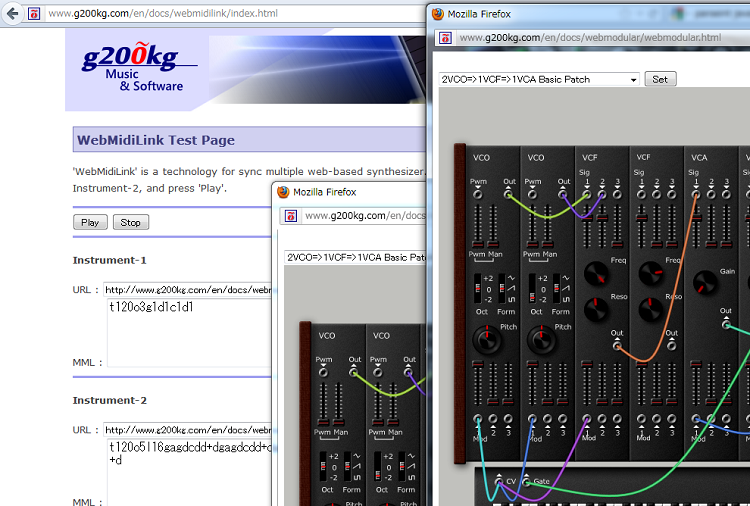 'WebMidiLink' is just for link web-based synthesizers. the "midi" is a ID and the rest is midi message represented as hex string. This page can load three web-synth and play MML simultaneously. If you are interested in web-based instrument development, supporting link function is great. WebModular modules description and tutorial page is now available. Now available the function converting Patch&MML data to URL. Bugfixed for Chrome Canary build. It is just a bug about the number of output channel. In this version, IE ,Opera or Safari can generate sound but I still recommend to use Chrome or Firefox because of latency and performance disadvantage. Chrome or Firefox is needed.